Imagine in your mind, if you will, a dinner party without a table. On Sunday we were hosting a dinner party. We had ordered a cassoulet “kit” from D’Artagnan and had invited a few friends we knew would enjoy eating duck + duck fat, beans, and sausage. A real peasant’s meal! Let me preface by saying our dining room table is old. If not antique, very vintage. We’ve owned it since 1985 and it was vintage/antique then. Made of quarter-sawn oak, it truly is beautiful. But, it’s Queen Anne style legs are very fragile. Rick has had to bolster two out of the four legs up over the years to keep the old girl in service. We were putting the extra leaf in the table when it happened. Even though we were being very careful how we moved the table (one of the legs had been a bit wobbly for a few years), when I set the table back down on its legs, the wobbly one split and fell off. Oh dear. In case it hasn’t occurred to you, having a table with only three legs does not work well for dinner parties of six people. With guests due in two hours we had several choices. 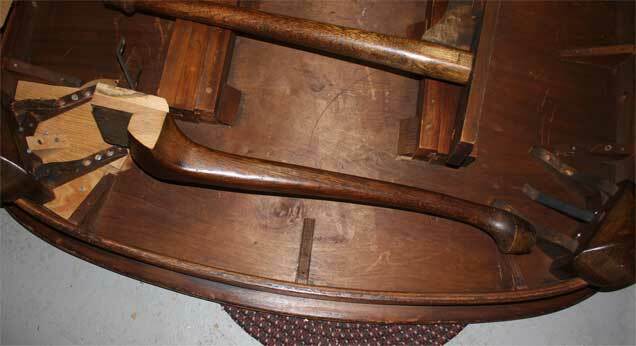 1) Try to fix the table leg by gluing it and hoping it held. 2) Stack up books on that end of the table to take the place of the leg. 3) Eat Japanese style on the floor. 4) Bring up the table from the basement that used to be in our kitchen in Colorado that we haven’t used in four years. Gluing the leg didn’t really seem like much of an option. Two hours is not much time to try and do something like that. I saw the scene playing out in my head something like this. Everyone sitting down to a beautifully laid table. Rick bringing in the heavy cast iron pot of cassoulet and setting it down on the table for ease of family-style serving. The minute the pot of cassoulet hits the table that’s the last straw for the quick-fix table leg (or stack of books) and everything goes crashing to the floor (including the guest sitting closest to the leg). So now not only do we have a broken table, but nothing to eat or eat off of either since everything is now on the floor in a pile of broken shards, beans, and duck legs. Erase that scene from your mind because it didn’t happen. We chose option No. 4 which was not without it’s own set of difficulties. First we had to get the broken table down to the basement. Did I mention above that Rick had fixed two of the legs previously? He fixed them so sturdily that they do not come off anymore. No way. And, this old table is extremely wide so it was not going to fit down the stairs to the basement without the legs coming off. Just not happening. So, out the front door we went with our cumbersome and sad broken table, through the gate to the back yard, down through the yard to the basement door and into the basement where she awaits surgery sometime in the far off future. Here you can see one leg that’s been reinforced and the broken one. 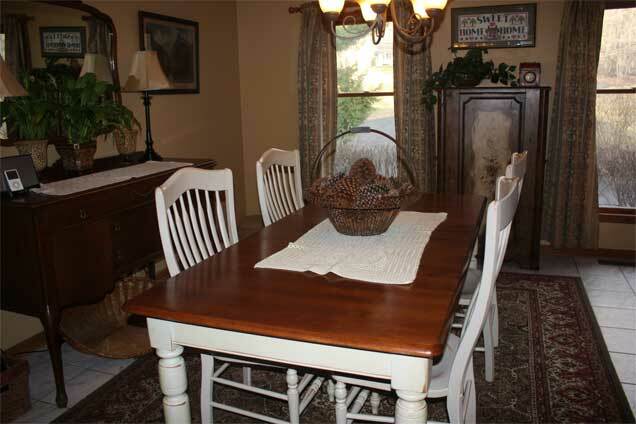 Next, we had to get the other table out of the basement and upstairs to the dining room. First I had to remove the boxes that were being stored on top of it and create a path around it. It’s big. It’s heavy. Heavier than the other table. A good sturdy farmhouse style table. All I can say is it’s a good thing the legs come off this one and it could be moved up the basement stairs instead of around the yard and into the front door. Even though it was only the top it was just too heavy for me to lift, so we had to enlist the help of neighbor Mark across the street (who just happened to be one of our anticipated guests). Soon we had the legs back on the table, the table set and ready for guests, and near disaster diverted. The dinner party that almost wasn’t turned into the dinner party that was. The “new” look for the dining room. OMG! Sounds like something that would happen at our house!!! No WONDER you need a break. Were you using those chairs with the old table? They look perfect with this one! Maggie, no joke! I wonder if our restaurant is going to be open with all the flooding?? Elizabeth, no these chairs go with this table. The other table had old oak chairs with leather seats. I have to admit that these are more comfortable! Well, I am glad the leg break happened while you were putting the leaf in, and not when you set the kettle on the table! Glad you escaped the flooding. Becky, you’re not kidding! I think the leg would have been okay had we not moved the table but you never know! Not very stable to begin with! The flooding is really bad down below us. Really bad. So sorry about your table! I am sure you had a million other things you would rather have been doing than a table swap a few hours before guests! Jan, yes we had plenty to do with the bread still baking in the oven! I think it got a bit crusty because we weren’t watching it closely enough! Not what we needed. Dinner was wonderful, the company was great, perfect wine, and the table was stable. Thanks.